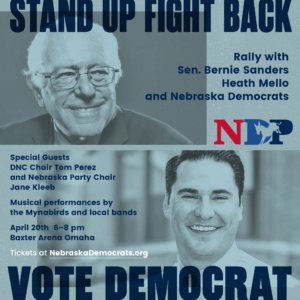 The Nebraska Democratic Party is proud to announce “Stand Up, Fight Back, Vote Democrats,” a rally in support of Democratic candidates in Lincoln and Omaha city elections. 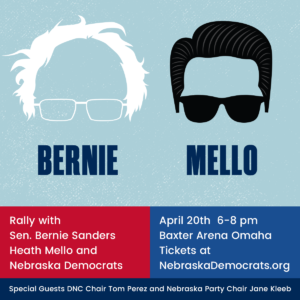 The rally will feature remarks from Senator Bernie Sanders, Democratic National Committee Chair Tom Perez, Omaha mayoral candidate Heath Mello and State Democratic Party Chair Jane Kleeb. Musicians–including the Mynabirds–will perform. The rally is part of a national tour sponsored by the DNC to connect with local elections and the grassroots base of the party. “Stand Up, Fight Back, Vote Democrats” rally will be held on April 20th at the Baxter Arena, 2425 S 67th St in Omaha. The program on April 20, 2017 will run from 6:00-8:00 PM, and doors will open to the public at 5:00 PM.